The Noise Braker utilizes the Hocks Noise Filter®﻿. allows air and sound to enter the ear. The Noise Braker is designed to reduce the intensity of sound waves, as the sound waves get stronger. The wearer can carry on a normal conversation. The normal voice can be heard with a slight reduction of volume, while the background noise is filtered out to a greater extent. In addition to the frustration of having to shout to carry on a conversation, workers are frequently unable to hear warning sounds or alarms. Having the ear completely sealed off can leave the wearer with a stuffy, plugged up feeling. Millions of hearing protection plugs are sold each year to musicians, music lovers attending concerts and festivals, farmers, hunters,﻿ sportsmen, travelers, hobbiests, motorcyclists, pilots, airport workers, landscapers and yard workers, construction workers, and industrial workers. It is an axiom of physics that we cannot create or destroy energy. We can, however, convert it. The Hocks Noise Filter® converts sonic energy into thermal energy by means of compression acceleration. The rise in temperature is so minute you will never notice it. You can still hear, but a dangerous level of sound can not possibly get through the filter. Custom Noise Braker and Standard Noise Braker﻿ ear protectors use the same Hocks Noise Filter®. Both work in the same way. The difference is in the shape of the product and in the fit. 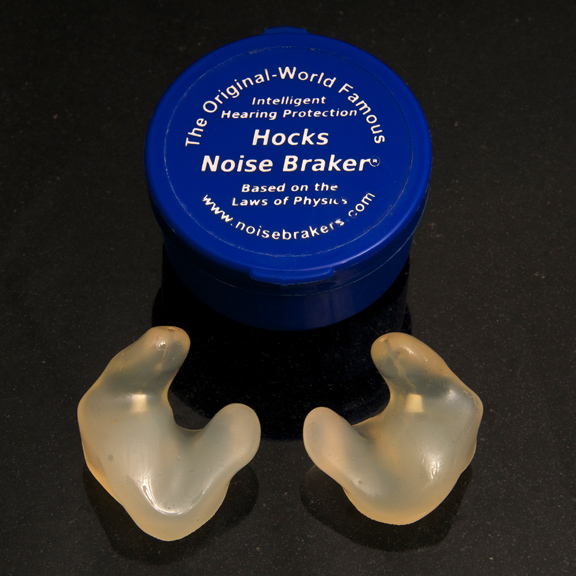 Custom Hocks Noise Brakers® are made from an impression taken from a person's ear. They completely seal off the ear. Any sound entering the ear will pass through the Hocks Noise Filter®. The ear mold is made, a hole is drilled into it, and the filter is placed in the hole. 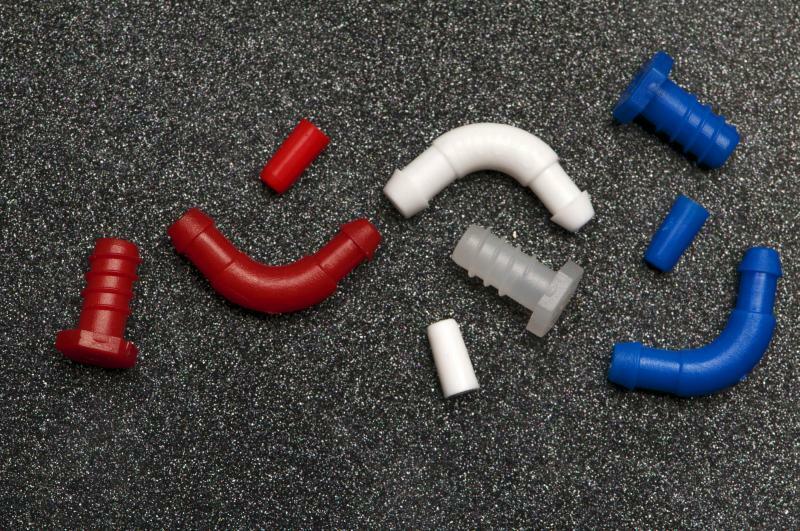 Because each plug is made for an individual, Custom Noise Brakers offer better protection than Hocks Noise Braker® Standards. Hocks filtered Noise Brakers are made to be continuously worn without discomfort, and permit conversational sound, air and changes of air pressure to enter the user's ears. 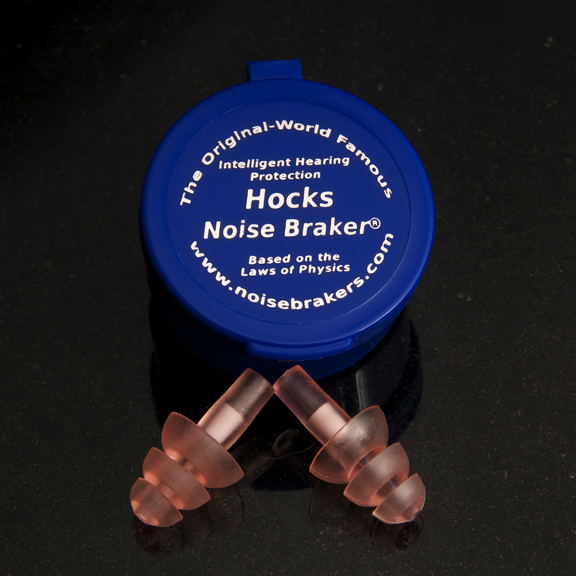 Hocks Noise Brakers®﻿ reduce harmful noise to non-damaging decibel levels. Damage received from excessive noise can amplify the effects of hearing loss caused by aging. Hocks Noise Braker® Standards are just that, standard. They are mass produced ear tips with the Hocks Noise Filter® inserted into the body. The soft and comfortable accordion style tip has three flanges that seal the ear from sound and keep the plug in the ear, leaving only one way for sound to enter the ear - through the Hocks Noise Filter®, thus allowing the filter to do it's job. The effectiveness of Hocks Noise Braker® Standards depends on how well the ear is sealed. This can change depending on the size and shape of a person's ear. Because the Standards are mass produced, they are lower in cost than Custom Noise Brakers. Worldwide, Hocks Noise Braker® products are recognized by industry and physicians as superior aural protection devices.